Can you crochet whilst walking to school? This was a question that went through my mind one morning 2 weeks ago - and no, you can't, not really. But you can sit in the corner at your daughter's school concert and happily 'hook away' in the dark (is that the correct term or do I sound like a call girl?!) to your heart's content - along with some rather unflattering squinting every now and then, without being noticed. Your crochet can also accompany you out for dinner with the family and grandparents - sitting discreetly on your lap at the local, family friendly Wetherspoons. This has been the story of the last 2 to 3 weeks, I've crocheted at school (the children have even pulled a lone tail of wool from my bag - I turned around and noticed 3 balls of wool all over the floor!) in the car to and from Ludlow (a blissful 3 hours each way, uninterrupted!) in bed, and many, many times when I should have been doing more important things...though on the loo has yet to be done but I'm never saying never! The reason for my passion is yet another crochet blanket. 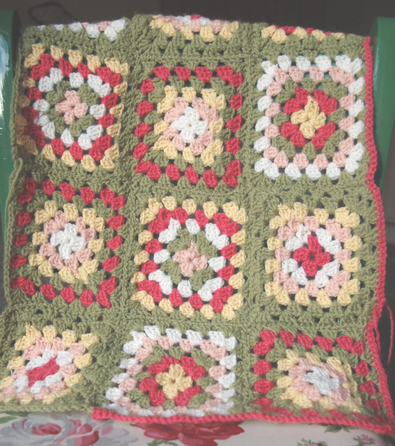 I have been driven mad with desire for the green Cath Kidston granny square blanket and needed to have one, now! So this blanket is the 2nd version of my own version of the Cath K one. I tried to copy her colours but couldn't get the exact match so decided to just make up my own. 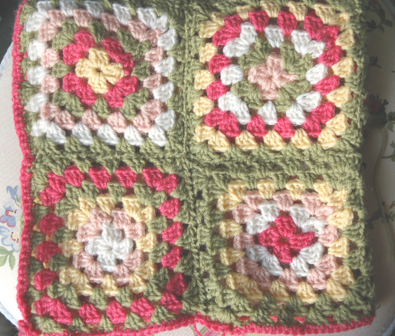 I found a granny square pattern on the internet and off I went. I was beginning to panic that it looked too khaki green so decided to sew some squares together to get a 'feel' of it's personality. I have edged it in the raspberry to detract from the green and I love it once more. I love most the wonderful feeling of being in love with your craft. Every spare minute is spent wanting to do more and more. Oh yes, I really love that and haven't felt that feeling for quite a while. In fact I have recently discovered another passion of mine and that is to crochet and listen to Anna Raeburn's podcast from LBC radio! I used to listen to Anna (a wonderful, wise 'agony' aunt for want of a better word) many years ago and then she vanished. I recently discovered that she is on a London radio station, unable to be listened to in Devon but they do podcasts. So I have 57 on my ipod to listen to and another 200 or so after that! Oh, the joy .. now give me my hook and my headphones and leave me to my bliss!